Holiday season is here and kids are home all the time running here and there. They keep asking for snacks all the time. I thought why not give them some thing different and healthy today. I have used frozen corn here. So let corn kennels come to room temperature then microwave it for a minute, or you can use as it is. Chop onion and tomato to small pieces and add to corn. Also add chopped cilantro and mix well. To make it little spicy add chopped green chili. 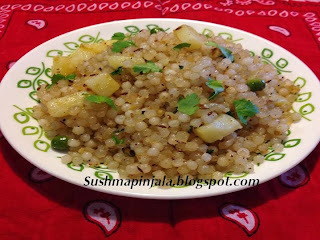 You can also add boiled potato cubed and chopped cucumber for extra taste. You can skip chili of kids are having it. Add salt to taste, chaat masala and mix well. In a cooking pan heat oil and add whole garam masala and saute for a minute. Now add sliced onions, green chili and cashew nuts. I have used frozen corn and peas here. Let the corn and peas come to room temperature, then microwave it for a minute. 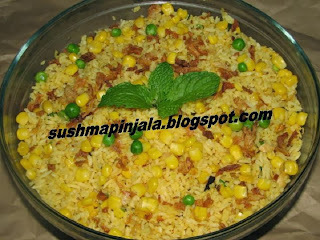 Now add peas and corn to rice and mix well. Also add garam masala and salt. Mix well and cook for another 5 minutes on medium flame. Before switching off the stove add fried onions and mix. Serve hot with any spicy gravy curry. Today we are starting with 4th and final week of BM 35. For this week I choose to cook recipes with Corn. Maize or Corn is a large grain plant. The leafy stalk produces ears which contain the grain, which are seeds called ketnels. Maize kernels are often used in cooking as a starch. 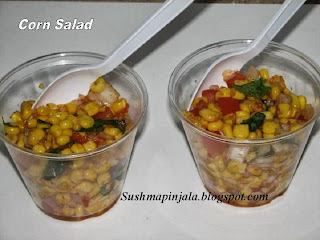 Corn is used in many ways in various cuisines. I have used canned baby corn here. 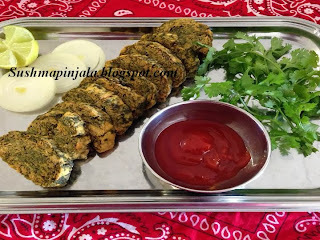 Kothimbir Vadi is coriander (Cilantro) mixed with chick pea flour or besan with some spices There are plenty of variants of this dishes some deep fried, some stir fried and some steamed. This snack item is very popular in Maharashtra. 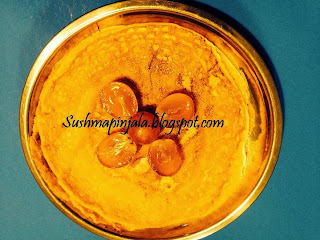 I made this vadi from Madhura'sblog. For day 2, I made Kothimbir vadi, a snack item under the theme - Any Regional with course specific. Remove the leaves from the coriander stems. Wash thoroughly and let them dry for 30 minutes on paper napkins. Make a rough paste with green chili, garlic and cumin seeds. You can add more or less chilies according to your taste. Now add besan, chili paste and salt to coriander leaves. Also add haldi, dhaniya powder and mix well. Add water accordingly to make a stiff dough. Sago or sabudana is often produced commercially in the form of "pearls". Sago pearls can be boiled with water or milk and sugar to make a sweet sago pudding. Sago pearls are similar in appearance to tapioca pearls and the two may be used interchangeably in some dishes. 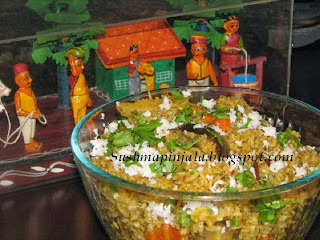 Many recipes can be prepared with Sago, like kichidi, vada, pudding, kheer, upma. Today's recipe is my son's favorite dessert " Pudding". 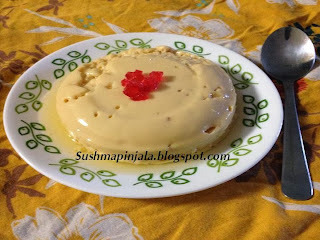 This is made with condensed milk, evaporated milk and eggs. I should say this is one of the simple and yummy dessert, which can be made in under 30minutes. It tastes some what similar to" Junnu" which is made with cows lactating milk. Mix evaporated and condensed milk together. I am not using sugar here as we have added whole can of sweetened condensed milk. Now mix well so that beaten eggs won't float on the top. Steam for 25 to 30 minutes. You can use regular presser cooker also. Cool it for 30 minutes and serve. This pudding can also be served with fruits . For best taste serve chilled. 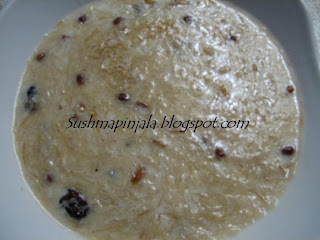 For day 2, am here with another popular and true classic dish "Sheer Khurma". Sheer means milk and khurma means dates. This is a Vermicelli Pudding prepared by Muslims on Eid. 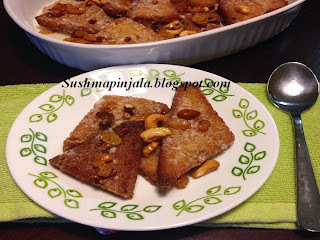 It is a traditional dessert for celebrations. . This dish is made from dried dates, milk, sugar, other dry fruits and vermicelli. Soak the dry dates in water for 3 to 4 hrs. Then cut them into long thing slices. Take a large pan and boil milk. Mean while in a small pan heat ghee and add all dry fruits. 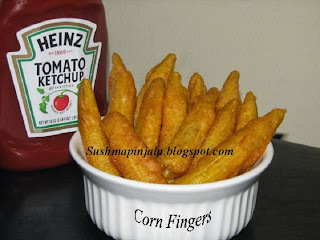 Fry them till golden brown and remove. If u dont have the roasted vermicelli, then roast the vermicelli too in the ghee after removing the dry fruits. When milk is half boiled add sugar and elachi powder and mix well. Now add roasted vermicelli and all dry fruits. Today we are starting with 1st week of BM 35. For this week I choose to cook Dessert, which can be served warm or chilled. 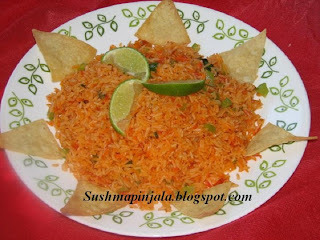 Hyderabad is popular for its Dum Biryani with Mirchi Ka Salan and to end the meal with yummy dessert "Double ka Meetha". Add water to sugar in a pan to make a syrup. In a non stick pan boil 2 cups milk on medium flame to make rabri. Keep string milk in between so that it won't stick or burn. Capsicum's are frequently used both chopped and raw in salads, or cooked in stir-fries or other mixed dishes. 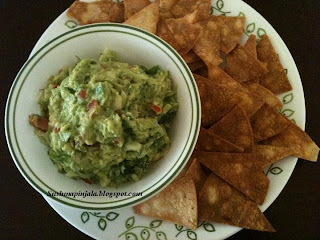 They can be sliced into strips and fried, roasted whole or in pieces, or chopped and incorporated into salsas or other sauces, of which they are often a main ingredient. 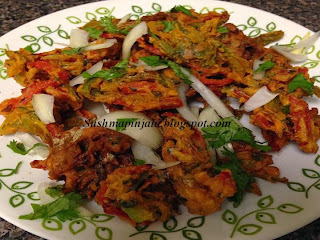 For day 3, under the theme " Cooking with Capsicum" I made Capsicum pakoda. Who doesn't like pokoda? Specially during monsoon and cold, cold weather Pakoda's are made in each and every Indian family. Capsicum or bell pepper sounds like it tastes spicy but they are sweet. Capsicums are rich sources of antioxidants and vitamin C. Compared to green peppers, red peppers have more vitamins and nutrients. Green peppers are less sweet and slightly more bitter than yellow or orange peppers, with red bell peppers being the sweetest. For day 2 of BM 34, I made Capsicum Masala curry. 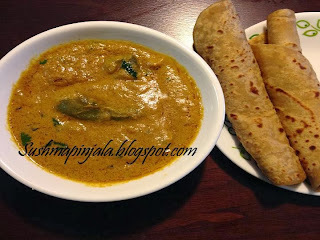 Made with very simple ingredients like peanuts, garam masala and onion paste. 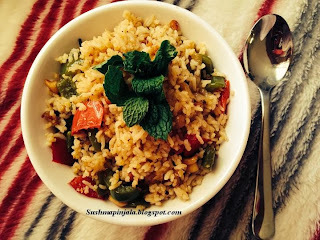 Tastes yummy with any spicy pulao, biryani, roti or naan.I this recipe I have used only green bell peppers. Roast peanuts, cool, remove skin and keep aside. Gring roasted peanuts and onion into smooth paste. Heat oil in a pan and add onion and peanut paste. Today we are starting with 4th week of BM 34. My theme for this week is "Cooking with Capsicum". Chop red and green capscium into small to medium pieces. 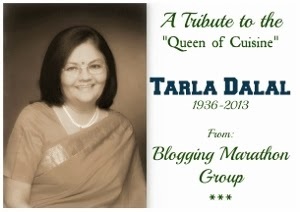 We all know that The Queen of cooking Tarla Dalal passed away on 6th November 2013. She is and always been Inspiration to me and all the cooks. I still remember watching her cooking show " Cook It Up With Tarla Dalal" on sony tv. Never got chance to read her cook books but always visited her website. She has a huge number of vegetarian recipes. 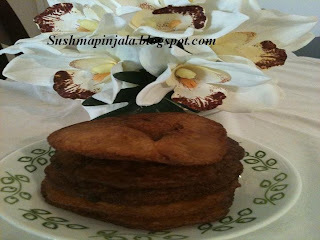 Our Blogging Marathon group have decided to do a Tribute to her, by cooking one of her recipes. Thanks Preeti for designing the beautiful logo. She will always be alive with her wonderful recipes. May her soul Rest In Peace. Made Creamy Cauliflower curry from Tarla Dalal's blog. Click here for the original recipe. Cut cauliflower into small to medium pieces and boil in water till 90% cooked. Heat oil in a pan and add mustard seeds, cashew nuts, curry leaves and chana dal. Saute and add udad dal and chopped ginger. Mix well and add sooji. Cook till the mixture turns light brown on low to medium flame. 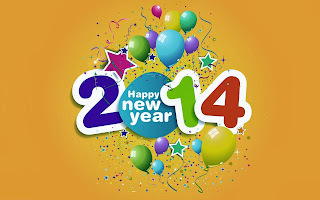 Switch off stove and let it cool. Now add salt and thick curd. 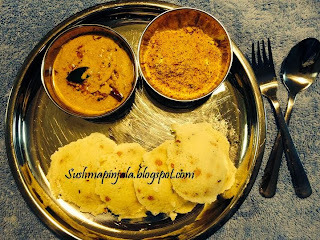 Mix well with spatula to make a thick consistency or as regular idly batter. Cover with a lid and rest it for 5 to 10 minutes. Now add eno fruit salt or soda and mix it again. Add sugar and rice flour to wheat flour and mix well. Now add little water at a time to make a smooth batter. 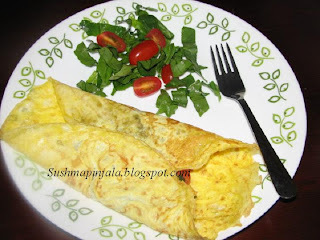 Consistency should be of the regular dosa which we prepare. Add a 2 scoops of dosa batter and spread it around. Spray little oil on top and let it cook for 2 minutes on medium flame. Flip it around and cook for another 2 minutes. Serve hot as it is. 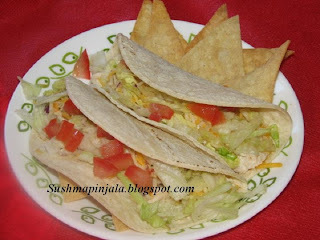 Check to see what my fellow bloggers are cooking for BM 34. 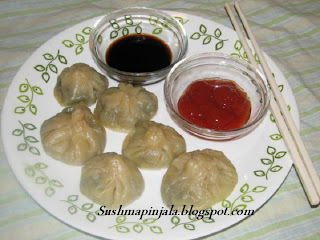 Its been a while that I have posted some new recipe here. Was busy with moving to New Jersey, my favorite place. I just love this place specially during Falls. Leaves changing into different colors. Here are some of the fall pics taken this weekend near my house. In a mixing bowl add rice flour, besan, sooji, salt, haldi, jeera / cumin and ginger chili paste. Mix with a spoon and now add little water at a time to make it a smooth batter. The consistency should be of the regular dosa batter.